This news release about the La Valle Golf Course in St. Kitts provides an update on the ongoing construction work. BASSETERRE, ST. KITTS, MARCH 20TH 2005 (CUOPM) St. Kitts and Nevis’ Prime Minister and Minister of Tourism, Dr. the Hon. Denzil L. Douglas is giving the thumbs up to his Labour Administration’s decision to focus on the development of an 18 hole international golf course in Sandy Point as part of the Whitegate Development Project in the overall economic development of St. Kitts and Nevis. The US$12 million international golf course will also see the construction of a marina, hotel resort and commercial and residential complexes. 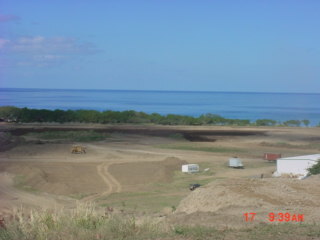 “When one views the fantastic sceneries that one is able to command from different points on the golf course, there is no doubt that it will spur on development, especially development in first class housing here in this part of the country,” Prime Minister Douglas said immediately after he and his Cabinet ministers concluded a tour of the La Valle Golf Course construction site. The golf course and driving range will be on 220 acres, 50 acres has been set aside for the future development of the course to 27 holes. The hotel/resort complex will be on 18 acres; the marina (10 acres); commercial complex (3.5 acres); residential complex (18.3 acres) and 8 acres have been set aside for a future sports complex. Prime Minister Douglas said the multimillion dollar project dovetails very nicely with plans for the overall national development strategy plan for St. Kitts. 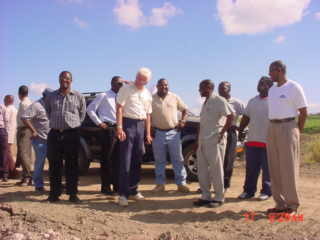 “Whitegate, including La Valle, Sandy Point and Cranston, has been identified in the National Development Plan as an initial growth point in this part of the country and to a large extent, we are very quickly arriving at the satisfaction that we had expected for St. Kitts and Nevis,” Prime Minister Douglas told the Communications Unit in the Office of the Prime Minister. 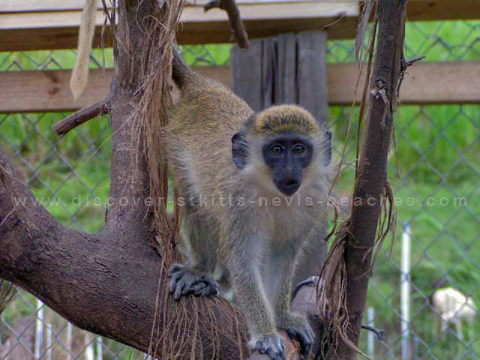 “There is no fear as to the opportunities that will develop as we move from one phase of our development, leaving behind the colonial past through the sugar industry and moving rapidly into a new and exciting strategy for economic development, utilising the beautiful landscape to enhance economic development of St. Kitts and Nevis,” he said. Dr. Douglas expressed satisfaction that his Labour Government has invested wisely and thanked the major players involved in this very important pioneering project. The golf course is being constructed by Howard Engineers, established in 1961, and which has designed and constructed some 200 golf courses in Canada and the United States including Indiana, Illinois, Arizona, Texas, Florida, Tennessee and Hawaii. 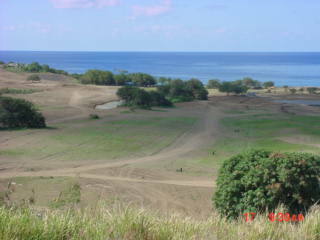 The La Valle Golf course is their first in the Caribbean. 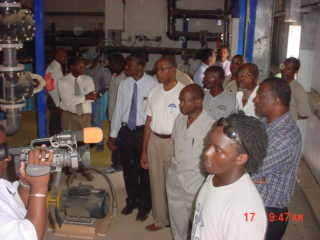 Photo #2 - Prime Minister Douglas, other Cabinet Ministers and officials touring the site. Photo #3 - Another area where construction is taking place. 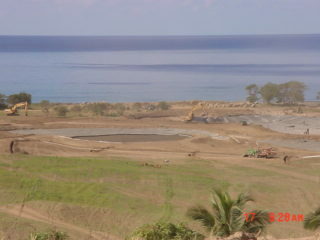 Photo #4 - Desalination plant has been constructed to provide water for the golf course. Photo # 5 - St. Kitts born Kevin Gumbs of the nearby village of Newton Ground explains the operation of the desalination plant to the Cabinet. 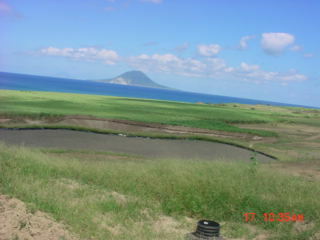 Photo #6 - A scenic view of St. Eustatius and Saba from the 12th tee.